In the process of putting this month’s mandala together, I heard the song “This little light of mine” playing in my head and thought “that’s perfect!” for this month’s mandala: Brilliance. In continuing my research I found that Marianne Williamson and Odetta both express “brilliance” so well that I’m going to let them tell us how best to shine. Let us break free of our ties that bind us so that we can let our Light shine with the Brilliance of all that we Are. 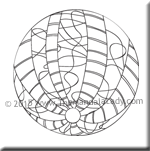 Be sure to check out Section 6 of the 2015 Mandala of the Year.